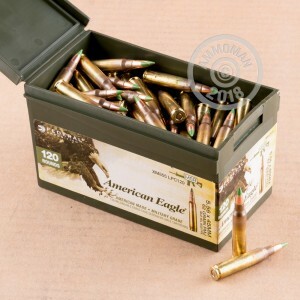 Packaged in reusable plastic ammo cans, this 5.56 NATO ammunition is a great value for your AR-15 or other 5.56/.223 Remington rifle. 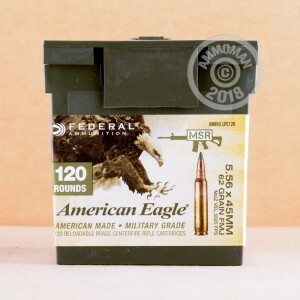 This ammunition is mil-spec Lake City production by Federal Premium Ammunition. Each round in this can fires a heavy 62 grain "green tip" full metal jacket bullet at 3,020 feet per second. This corresponds to the M855 ball standard currently used by the US military. These cartridges use non-corrosive Boxer primers and reloadable brass cases with visible annealing marks. Grab a few of these cans or any other items totaling $99 or more to get free shipping from AmmoMan.com! 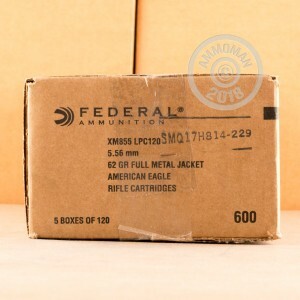 I have used different online retailers to purchase ammo in the past. Looks like I found a permanent home. Ammoman not only has great prices and specials, but the delivery is super fast. I had my rounds on my doorstep in two days. Keep up the good work Ammoman!